We’d love your help. Let us know what’s wrong with this preview of Our Pristine Mind by Orgyen Chowang. A Tibetan Buddhist master shows how to pull away the veil of preconceived notions of ourselves and the world in order to find true happiness. In this effective, jargon-free guide to the apex of Tibetan Buddhist teachings, Orgyen Chowang empowers us to gradually experience our mind as pure awareness--free from the feelings, thoughts, and other mental events that obscure its A Tibetan Buddhist master shows how to pull away the veil of preconceived notions of ourselves and the world in order to find true happiness. To ask other readers questions about Our Pristine Mind, please sign up. Orgyen Chowang’s book “Our Pristine Mind” has left a lasting impact on how I perceive the world and my own thoughts and feelings. This is THE BOOK that can trigger a change in your life leading to happiness and contentment. It did for me. It feels like a book that you could pick up again and again and read cover to cover and it gives advice that feels almost too honest at times. 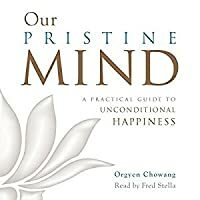 When I read through short portions describing how thoughts have power because we pay attention to them, I thought “thi Orgyen Chowang’s book “Our Pristine Mind” has left a lasting impact on how I perceive the world and my own thoughts and feelings. This is THE BOOK that can trigger a change in your life leading to happiness and contentment. It did for me. It feels like a book that you could pick up again and again and read cover to cover and it gives advice that feels almost too honest at times. When I read through short portions describing how thoughts have power because we pay attention to them, I thought “this is me!” I read hungrily through the meditation sections, trying to experience what must be second-nature for Orgyen Chowang because his instructions are so clear. 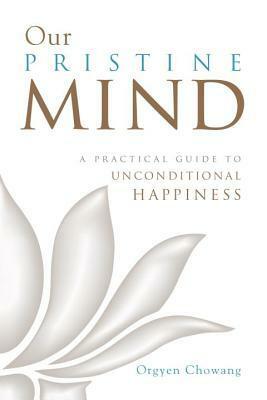 I immediately saw benefits of feeling more calm and happy as I read through “Our Pristine Mind” and of my hope increasing that actual true unconditional happiness is totally possible for me. It’s not mysterious, it’s really clear, and feels achievable. “Our Pristine Mind” gives honest, direct and clear instructions about how our minds work and so that we could choose to improve it. One of my favorite sections of the book provides insights into developing a Good Heart, and the qualities of love, compassion, rejoicing, and impartiality and how these qualities make life more beautiful. These are lessons I would want every young person to know, and were valuable and helpful to me to apply in my adult life. Recommends it for: anyone and everyone. After doing a lot of Vipassana meditation, I got interested in Tibetan meditation and Dzogchen in particular. My practice so far has been largely shaped by "pragmatic Dharma" teachers such as John Yates (The Mind Illuminated) or Daniel Ingram (Mastering the Core Teachings of the Buddha). I've read a few times that learning Dzogchen meditation kind of requires a teacher and can not easily be learned from a book, so I was excited when I read a review of this book that compared it with TMI and MCTB After doing a lot of Vipassana meditation, I got interested in Tibetan meditation and Dzogchen in particular. My practice so far has been largely shaped by "pragmatic Dharma" teachers such as John Yates (The Mind Illuminated) or Daniel Ingram (Mastering the Core Teachings of the Buddha). I've read a few times that learning Dzogchen meditation kind of requires a teacher and can not easily be learned from a book, so I was excited when I read a review of this book that compared it with TMI and MCTB. I was hoping for something concrete, down to earth, rational, to the point, and pragmatic. The book is pretty secular and non-religious, which is what I was looking for, but besides that I was very disappointed with it. It's a lot of babbling and 90% of the book is empty words that contain no real useful information. The actual meditation instructions can be summarized in one or two paragraphs. Maybe a few more pages to add some context and motivation. But that should be it. The rest of this book is just spiritual bla bla that, admittedly, is kinda nice to read for a while and sounds pretty deep at times, but at the end of the day I didn't really feel like I'm getting anything out of reading it. I had similar feelings after reading Eckhart Tolle or Garry Weber. Excellent book on advanced meditation practice. This is a very good beginners book for the understanding and practice of dzogchen. Clearly written for the western minded reader. Our Pristine Mind is a unique and wonderful book with a very unusual, deliberate and organic structure. Starting with the stylized lotus designs on its front and back covers unfolding to make a flower whole, and the telling first word “Our” in the book’s title, it is very rich and deliberate and needs to be read from beginning to end. Buddhist teachings need to be understood in the context of Buddhist practice. Buddhist practice needs to be understood in terms of the state and nature of our minds Our Pristine Mind is a unique and wonderful book with a very unusual, deliberate and organic structure. Starting with the stylized lotus designs on its front and back covers unfolding to make a flower whole, and the telling first word “Our” in the book’s title, it is very rich and deliberate and needs to be read from beginning to end. Buddhist teachings need to be understood in the context of Buddhist practice. Buddhist practice needs to be understood in terms of the state and nature of our minds and lives. At some point, in order for practice to develop, faith in the teachers, teachings and goals of Buddhist practice must be engendered. Learning, faith and practice… modern Buddhist books in the West, facing new and curious but sometimes skeptical, busy and hassle-averse audiences, have to find a way to bridge these divides. Our Pristine Mind blazes trail. The book, written throughout in clear and modern English, starts out with a familiar thematic “how-to” approach. First comes “Our” human predicament, the problematic consequences of having a mind, and knowing it, of living with and at the mercy of uncontrollable thoughts, emotions and all kinds of “mental events.” This leads to the subject of “changing our minds” through the practice of meditation. Next, the simple, straightforward techniques of pristine mind meditation are taught. Then, over the course of several key chapters, the stages of development of proficiency in this practice, from beginning to advanced, are described experientially in exquisite detail. These are depictions that the author, Orgyen Chowang Rinpoche, can offer because he is a meditation master who lives these things. How does it feel to think like this? What is the difference from our normal thinking? How does this change our lives? How does this affect the environment in which we live? Here is where the book really starts to surprise and really takes off. I think most readers who have some experience in meditation will be able to understand, believe and relate to the experiences described as the early stages of development of pristine mind meditation. We are inspired that we can do that, or are close to that. But, if we are honest, we may have to admit that the higher stages of the practice sound great, but are beyond our present personal reality. At the same time, because of the skillful way that the higher stages are shown to be a direct continuum of what comes before, these stages do not seem foreign or incredible at all. On the contrary, they seem at hand. This is an inspiring revelation for the reader. Faith is elicited and hope is taught. At the same time the author, Orgyen Chowang Rinpoche really comes to light here as a teacher, explaining, showing something to us that we did not know before. He is indeed part of the “our” in Our Pristine Mind, a person, having a mind like us, and practicing meditation. But there is separation in that he has gone farther than we have. So now the atmosphere of the book expands, not by exalted title, by executive order or hyperbole, but organically. Positive humility, the humility of accepting the person or even the possibility of a teacher, allows for the emergence of honest questioning, so honest questions emerge. How to get there? Reflecting this, the book's next section beautifully answers questions, such as ‘the purpose of it all,” “going beyond mindfulness,” “overcoming obstacles,” ”don’t give up,” “student-teacher relationship” and “dying with pristine mind.” And goes on to introduce the need to develop a “good heart,” by way of the four cardinal virtues of boundless love, compassion, rejoicing and equanimity, as the concomitants of meditation practice in daily life. What a beautiful book. There is much to learn from this book. Yet, I found that the author pretty much repeats for 50 pages the wonderful glory of the Pristine Mind. I found the practical instruction fairly minimal. What do you mean? I should open my eyes and gaze? I found my eyes watering when I did so, and I wasn't sure if that was the right way. The philosophy is beautiful and something I needed to imbibe. Good book on meditation and mindfulness. This is an extraordinary book.